It's A Dan's World: ALPHA MALE: Phil Jimenez + Canada's Best? ALPHA MALE: Phil Jimenez + Canada's Best? What's a team got to do to get a little press around here? With a giant orange Sasquatch, an acrobatic Puck and a magical Shaman in their midst, you'd think the variety and craziness of Alpha Flight would net them a little more headline space. 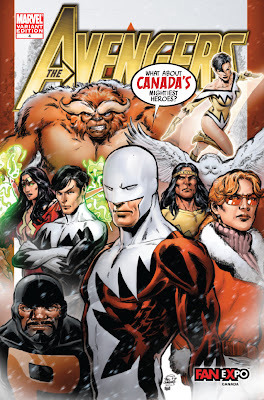 CBR's T&A column; "However, if you happen to live in Canada (or are just visiting during the right weekend), the members of Alpha Flight are taking over for the Avengers, at least for one special variant cover to "Avengers" #4 illustrated by Phil Jimenez. This special extremely limited edition will only be available for purchase at the Fan Expo in Canada on August 28 and 29. And wait'll you read the cover copy! Y'know, if somebody like Phil were to illustrate it, I bet we might be able to get an Alpha Flight series to sell at that..."
Alpha Flight possibly on the way back with an all-star line-up, drawn by Phil Jimenez and (if rumours remain true) written by Jim McCann? Now THERE'S a headline! Hey Shag, I'm a big fan of Alpha Flight too, ever since I saw Sasquatch on a Marvel subscriptions ad. Then when I actually read a book about the team - yeah I was hooked!